Continuing on with Thanksgiving wines, I picked up a couple bottles of Riesling. I like Riesling, and with a crowd of 15 for dinner, I thought it would go over well with all different wine tastes. Swinging by the Madison Wine Exchange a couple days before the big event I saw they had a bottle of Riesling from a Connecticut winery and I thought it might be nice to have a bottle of local wine for the evening, though the grapes are sourced from the Finger Lakes. 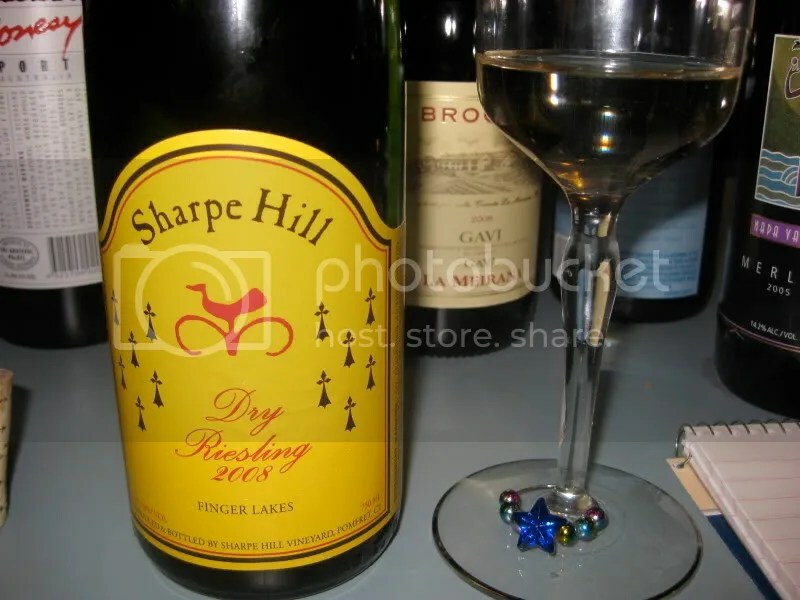 I chose the 2008 Sharpe Hill Riesling. It had a real cork closure, clocked in at 12% alcohol by volume, and I believe it cost us about $17. On the nose I found honey, apricot, honeysuckle, and honey. In the mouth I got citrus, orange, tangerine, and honey. It had a slight metallic aftertaste that I didn’t care for. When I went to visit my parents over July 4th, we stopped in at Branford Wine and Spirits. Jay, the owner, was asking me what kinds of Italian reds I like, and I mentioned how much I had enjoyed several bottles of Negroamara last winter. He pulled out this bottle and sent it home with me to try. We drank this on its own the other night, the 2006 Tormaresca Neprica. The wine is a blend of 40% Negroamara, 30% Cabernet Sauvignon, and 30% Primitivo. It clocks in at 13% alcohol by volume, has a real cork closure, and appears to run between $10-$15. On the nose I found chocolate covered cherries, cherry cordials, currants, wood, choclate, and licorice. The nose had a bit of heat, which was odd at 13% alcohol, but it blew off quickly. The mouth showed cherries, raspberries, herbs, bitters, and licorice. The flavor had that nice bitter quality that draws me to the Negroamara grape. 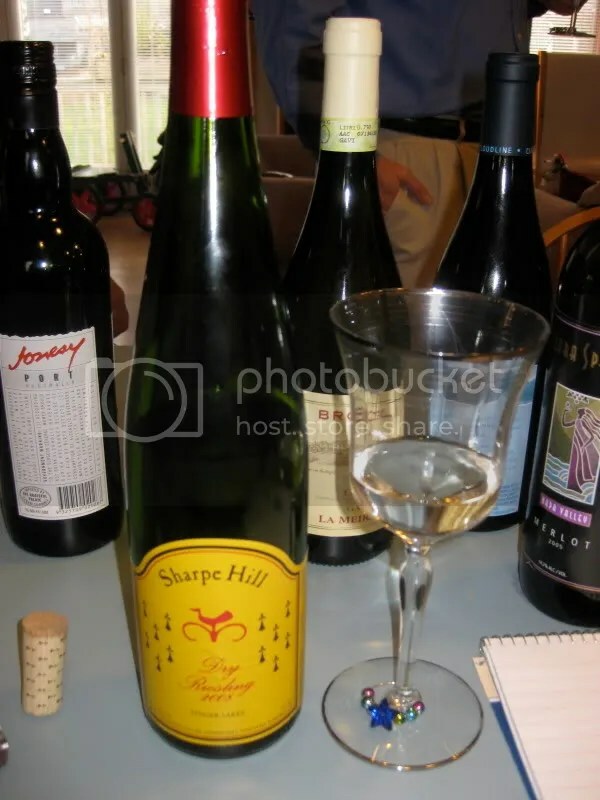 Overall, the wine was smooth, integrated, and well balanced. Very food friendly, certainly helps continue my affair with Negroamara! Despite having lived in Connecticut for the vast majority of my life, I had never had a chance to taste wine from the state before this Christmas. While spending a lengthy holiday visiting my family, Matt and I decided to hit up a vineyard in the town next to my parents’ house to see what CT wine is all about. 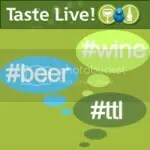 Now, I’ve heard of others reporting back on CT wine, even Dr. Debs on the west coast has had some! So it was high time I got my act together. We went early one morning to visit Chamard Vineyards in Clinton, Connecticut. Chamard is one of the oldest vineyards in CT, and benefits from the cooling effects of Long Island Sound in growing their grapes. They also source some of their fruit from Long Island. On the nose of the wine I found pineapple, toast, cedar, and lemon. The wine was oaked, but that was not the primary aroma at all, which is a very good thing in my opinion. I prefer “naked” chardonnay, but I do believe that oak can be done very well if the winemaker is not heavy handed with it. In the mouth I found apple, pear, and pineapple. Again, the wine had a toasty sense from the oak, but it was just that, toast, with none of the butter slathered on a wood plank feeling that oaked Chardonnay sometimes leans to. The wine was very smooth in the mouth and drinking very well. We picked up several bottles of this, some Pinot Blanc, and some Rose. Charmard had really pretty grounds, and I would love to return when everything is in bloom!